Denver, Colorado, has come a long way since being founded in the mid-1800s as a mining hub amidst the gold rush of the Wild West days. This remarkable city has transformed throughout the years from a place of gamblers and gunslingers to an easygoing community of progressive minded, ambitious, nature lovers and fitness freaks. With a 5,280 foot elevation, Denver has earned its nickname as the Mile High City as it sits at the base of the gorgeous Rocky Mountains. In the area there are a multitude of opportunities for outdoor recreation, but Denver is best known for its snowboarding and skiing. Popular outdoor attractions in Denver include Cherry Creek State Park and Red Rocks Park, both within a thirty minute drive of Downtown. These and other destinations are easily enjoyed throughout the year, because the weather is generally dry and sunny. In fact, while some might mistakenly expect Denver to have bad winters, it ordinarily experiences powdery snows that melt by noon and bright blue skies. This outstanding city also has truly spectacular options for shopping, dining and entertainment. As a result, U.S. News ranked Denver No. 2 on their “Best Places to Live” list, based upon the city’s job market, quality of life and people’s desire to live here. Those considering relocating in the Mile High City will be delighted to find diverse real estate options. 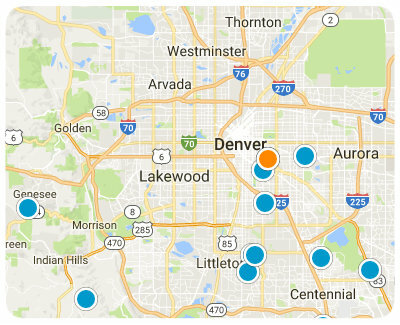 Typically homes southeast of Downtown, near Cherry Creek, have the highest listing prices, while the average sale prices for homes in neighborhoods east and west of Downtown tend to be much lower. Edgewater and Aurora have some of the most affordable housing options in the area. Whether you are looking for modern high-rise condo, a charming and affordable starter home, a large and luxurious estate, or something in between, you’ll find exactly what you are looking for in the Mile High City. If you would like to learn more about the homes for sale throughout Denver, Colorado, please allow us to assist you and contact us today.